State Director General of Police Shesh Paul Vaid responded to a question about the ISIS’ mouthpiece, Amaq News Agency claiming responsibility for Friday’s encounter at Zakura in Srinagar. Islamic State forays into Jammu and Kashmir? SRINAGAR: Just days after ISIS claimed responsibility for an encounter in Srinagar in which a police officer and a terrorist were killed, the police chief of Jammu and Kashmir ruled out the presence of the international terror group in the State. 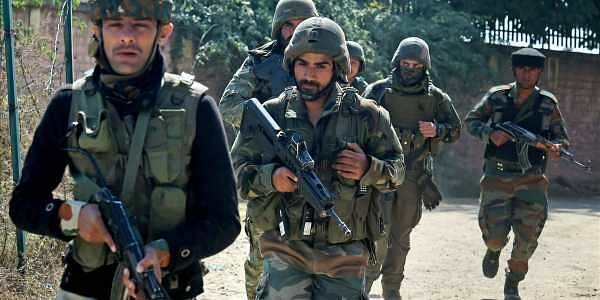 “ISIS has no imprint in Jammu and Kashmir,” State Director General of Police Shesh Paul Vaid told reporters on Sunday, while addressing a joint Press conference with the Army and Central Reserve Police Force officials at the headquarters of Srinagar-based 15 Corps at Badamibagh Cantonment. He was responding to a question about the ISIS’ mouthpiece, Amaq News Agency claiming responsibility for Friday’s encounter at Zakura on the outskirts of Srinagar in which police officer Firdous Tak and a local terrorist Murgees Ahmad were killed, a Special Police Officer was injured and a militant was arrested. This was the first time that the jihadi group claimed responsibility for any shoot-out in the State and DGP Vaid said the ISIS’ claim was being verified. “The claim is being investigated. On one hand, militant group Tehreek-ul-Mujahideen has claimed that Murgees was their man and on the other hand, there is an ISIS claim,” said IGP Kashmir Muneer Khan, who was also present at the Press conference. “However, I rule out ISIS presence in Kashmir,” he asserted. Murgees’ body was wrapped in the black ISIS flag during his funeral procession and the terror group’s flags were also waved during the burial in Parimpora on the outskirts of Srinagar on Saturday. Tehreek-ul-Mujahideen, which claimed that Murgees was their Pulwama commander, said that placing the ISIS flag on the slain militant’s body was meant to malign the Kashmiri “freedom struggle”. Sources said Murgees was initially associated with the Hizbul Mujahideen and later joined the Zakir Musa-led Ansar Ghazwat-ul-Hind, an Al-Qaeda Kashmir cell. However, after being injured in Friday’s encounter at Zakura, Murgees had called his family on the phone and told them that his body should be wrapped in the ISIS flag. After Murgees’ death, his picture with an AK-47 rifle and an ISIS flag in the background had gone viral. There have been many instances in the past when youth in Srinagar and some parts of the Valley had waved ISIS flags during anti-India protests.